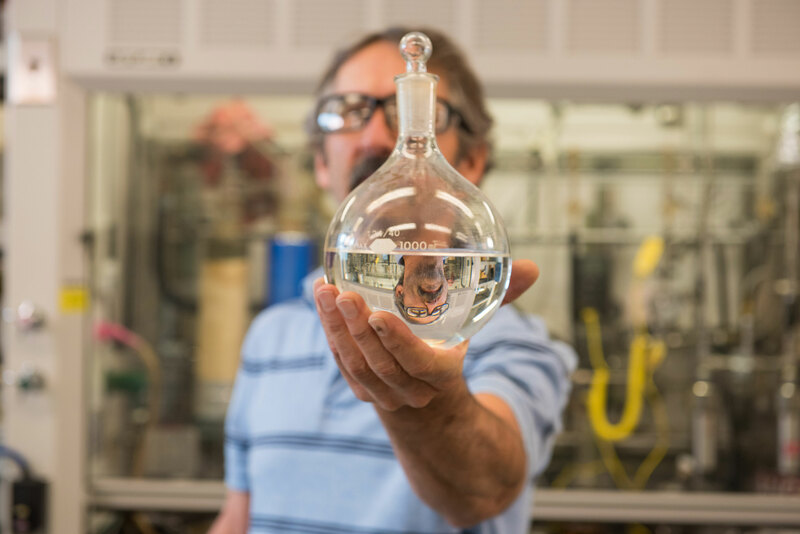 PNNL researcher Rich Hallen helped develop a process that converts ethanol to jet fuel in partnership with LanzaTech. Though the ethanol can be sourced from any raw material, sugar, corn, trash etc., LanzaTech produces ethanol using waste gas emissions from industrial sites. By coupling the waste gas to ethanol and ethanol to jet processes, the team can make industrial waste gases into jet fuel. An international standards body, ASTM, just revised their standard to allow ethanol as a feedstock to produce jet fuel. RICHLAND, Wash. — ASTM International recently revised ASTM D7566 Annex A5 — the Standard Specification for Aviation Turbine Fuel Containing Synthesized Hydrocarbons — to add ethanol as an approved feedstock for producing alcohol-to-jet synthetic paraffinic kerosene (ATJ-SPK). The revision of ASTM D7566 Annex A5 clears the way for increased adoption of sustainable aviation fuels because ethanol feedstocks can be made from so many different low-cost sources. Behind this significant advancement is the Department of Energy's Pacific Northwest National Laboratory technology — eight years in the making — and its industrial partner, LanzaTech. Using its expertise in chemistry and catalysis, PNNL developed a unique thermocatalytic process for converting ethanol into ATJ-SPK. The first step of the process is to convert the ethanol into ethylene ("dehydration"). During the second step ("oligomerization"), ethylene molecules are chemically combined to build the range of hydrocarbon molecules needed for aviation fuel. These hydrocarbons are then hydrogenated, followed by fractionation to produce alcohol-to-jet synthetic paraffinic kerosene with the desired properties. The process can use ethanol from any source, including ethanol produced via LanzaTech's proprietary gas-to-ethanol process. PNNL worked with LanzaTech to scale up the catalyst, and LanzaTech scaled up the entire process to produce 4,000 gallons of ethanol-derived ATJ-SPK. LanzaTech compiled the data from extensive analysis and testing of the ATJ-SPK product into a research report for review by the Federal Aviation Administration as well as aircraft and engine OEMs. The review verified that the ATJ-SPK meets all fit-for-purpose properties required by ASTM D4054, the Standard Practice for Qualification and Approval of New Aviation Turbine Fuels and Fuel Additives. Following this review, a ballot was submitted to the ASTM membership to approve the addition of ethanol as a feedstock in ASTM D7566 Annex A5, which passed on April 1 of this year. A second ballot also passed, increasing the blend ratio of ATJ-SPK to 50 percent from 30 percent. As a result, sustainable aviation fuel produced from ethanol using an alcohol-to-jet process can be used by commercial airlines in up to 50 percent blends with conventional jet fuel. "Commercial airlines consume a lot of fuel, and it is a major contributor to their costs. Sustainable aviation fuel offers airlines another option, which has benefits for the environment and offers a hedge against swings in oil prices," said Corinne Drennan, sector lead for bioenergy technologies at PNNL. "ASTM qualification of ATJ-SPK at a 50 percent blend ratio is a significant step forward. In theory, half the fuel powering commercial airlines could come from ethanol-derived fuel. We look forward to advancing the technology to bring down production costs and further improve the carbon intensity of sustainable aviation fuels from ethanol." "ASTM qualification of ethanol derived jet fuel means that where there is sustainable ethanol we have the potential to produce low carbon jet fuel" said Jennifer Holmgren, chief executive officer of LanzaTech. "The scale of production is what matters, and the inclusion of ethanol in ASTM D7566 Annex A5 is, therefore, hugely significant as it means we can access large volumes of sustainable ethanol feedstock globally to support the aviation sector's decarbonization targets." ASTM International develops standards across the globe for a variety of industries, including aviation. Its standards are used by businesses and governments to ensure a high degree of performance. This work was supported by the Department of Energy's Bioenergy Technologies Office.